OH SO COOL you’re going to be at MASW. I’m driving up for the day on Sunday!! I will drop by to say hey. Pray for good weather. These are every kind of fabulous!!! The colors are incredibly vibrant. I need to finish up mine, pronto. Hot diggety, those are some of the prettiest pot holders I’ve ever seen. How are you liking the Mini 9? I am seriously tempted to get one once I replace my dying Powerbook with a desktop, so that I still have something portable. So cute — love the bright colors! What awesome color combinations! I love them. I love toddy! I haven’t started yet this year, but have been thinking about it constantly. You’ve inspired me. Thanks! ps. the coasters are totally adorable! Woo! Hoo! They look great! I loove them. Mine are done, but I’ve been an utter slacker about posting them. Oh, my gosh these pot holders are gorgeous. I am a little rusty on my crocheting going to pass along the pattern to my mother. Great color combo’s!!! love the photo. Great post! Super cute potholders. Thanks for the inspiration. I love the cold-brewed coffee. The low acidity makes it easier on the tum too. The mimobot is too cute! What an excellent place to store your recipes. Your potholders put mine to shame. Lovely colors…so bright and cheery! 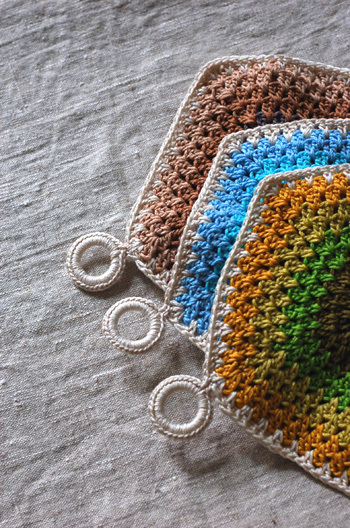 Love the potholders in all their color combinations. I also am a huge toddy fan since last year! I actually just use my french press to make the concentrate, then strain into a mason jar which I keep in the fridge. I drink it with homemade almond milk or regular soy milk. You. Evil. Woman. And I need a flash drive too. 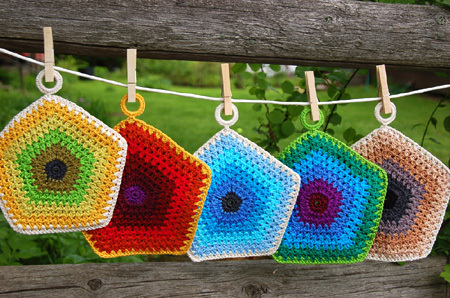 Okay, I’m not keen on crochet at all, but those potholders are nice. Love the colors. Is that yarn a single? Looks shiny. BEAUTIFUL!!!! Love the shape, the colors, everything! oh!! I didn’t know about the swap before i showed my collection and Zaz told me about it. What a happy colour combination. Hey Adrian! Could you post on the swap blog for me? My potholders arrived and they’re wonderful. Post up on my blog. Yours are great – I’ll have to check out the pattern for myself!